Helen & her assistant, FJ Hughes, are amazing and I cannot thank them enough for the day. I abosolutely loooooove plants & especially fresh green ones like ferns and the baby's tears & pearl somethings I found that we used this past week. I am trying so desperately to keep them alive and would love any tips. I've been misting daily. Like a misting freak. So this better do it. Hope you're enjoying your weekend and have a beautiful one!! I'm a bit of plant-a-holic so I have little garden corners all over my house. You really have to find the spot that has the right sun for each particular plant. While I've had ferns for years and even get my orchids to rebloom I've never had luck with ivy which is supposed to be the easiest. Some plants work, some don't. Good luck keeping those new ones green! OMG is this your house. I love how you did this. I love plants and have a fabulous garden - but I can't keep ferns and ivy alive for the life of me. I buy orchids a lot from Trader Joes (cheaper than flowers - $12.99) and they usually last for a month - of course, if I watered them they would last longer. I put them on my fireplace in vintage teapots, urns in my bathroom, etc. But I love how you did this vignette...looks awesome! What a pretty plant dying center. ha. Your house looks gorgeous. Can't wait to see the finished photos...and the magazine debut! So pretty! I have the same "can't keep plants alive" gene that you do. But I keep trying. I refuse to buy fake ones. At least my plants last longer then fresh flowers do. This corner looks so pretty. I am so drawn to green and an easy way to bring that color of nature in is with plants! I also LOVE botanicals. Could you tell me where you found the botanical on your wall!? Love it!! I am great with plants outside, flowers in vases but greenery in the house it dies .....I enjoyed your blog and your post. Happy Saturday!! It sbeautiful here today! I'm unable to keep plants alive either but for a whole different reason. My Cat (Biggles) destroys them. He bites it, jumps on it, and claws at it.. until there are no more leaves left! Very pretty! I have found baby tears plants do best for me when I water them from the bottom only. I have also found that when given the choice it is always better to under water than over water. Lauren I love it and I think I could do something similar in a corner of my living room! Thank you for the inspiration! Better homes and gardens December is out at Barnes and Noble, bought it but haven't looked at it yet, so excited for you!!! Bought my copy of BHG yesterday! I was so excited for you!!! It's funny because my husband and I are living in our first home, and I always tell him it's my dream to have our home published in BHG- and you've done it!!!! Congrats!!! I corner with some plants can make all the difference in the look and feel of a room. Unfortunately I am not very lucky with keeping house plants alive in my home either although I'm very successful with my garden. I know how you feel like Lauren and I was misting like a freak too, but then after I left for a long weekend and everything was about dying again when I came back, I just gave up and added artificial flora to my rooms and every now and then some fresh flowers. I wish you best luck with your plants. Add some mild fertilizer for indoor plants once in a while, maybe that will help on your end. I didn't do the trick for me either. Lauren, it all looks gorgeous. I hate house plants myself which is funny because I really love outdoor gardening. We have several house plants (David's) which I despise. I moved them from my living room to the office so I would not have to look at them and they are thriving. African violet is constantly covered with flowers, Christmas cactus blooms monthly. They love it in this slightly cool room with a south west window that gets shaded late day light. Unless they are succulents and desert plants, keep them out of direct light. Water more for ferns and less for everything else. For someone who hates plants, I have many successful ones and some at my office which I inherited and which are also thriving (low oxygen environment likely). Honestly, neglect and not direct light works for me. Plant food I have heard is a godsend. If you want amazing plants, plant FOOD is king. They will be beautiful. I wish you lived closer and you could take mine to a photo shoot and kill them. I will admit baby's breath and teardrop ferny things are very sweet and pretty. I also like anything grey-green and chalky, like those lamb's ears that are succulents. And I like Aloe. I hate those tropical tree things with big broad leaves. Ick. You make me want to be a better (plant loving) person. xo T.
I love getting BH&G and flipping through the pages, usually in order, but today, I went right to page 66...congratulations....the layout and pictures were awesome!! I love this photo of your home! magazine last night... I could hardly wait to rip it off the shelf. I just wanted to tell you how much I loved reading the article about you and your home. Your home is so beautiful, and you are such an inspiration to us all.... I just love your style. I love how you added twigs to your Christmas tree, I can't stop looking at all the pictures of your home. Congratulations Lauren! Looks so wonderful! My ferns live forever. I give them a good water with the kitchen sprayer so that all of the leaves get wet too. with some I have some rocks in the bottom of the waterproof container with the plastic pot on top. I leave a little bit of water in the bottom so it is moist but the soil isn't in water. what a pretty corner! One of my new favourites..hope you don't mind if I mention it on my blog? as for houseplants, I try to group ones that need more watering and less together, for sanity's sake! 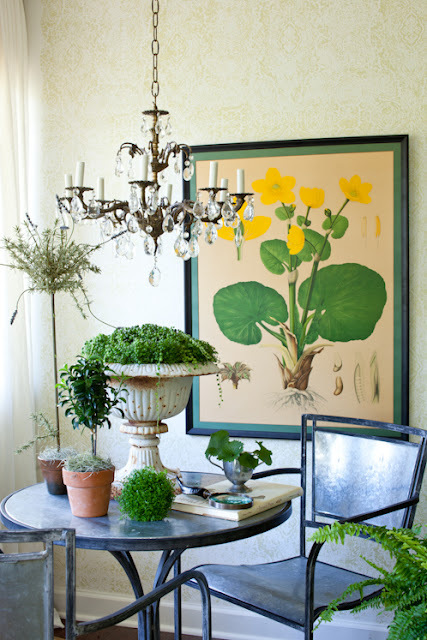 I love this- the artwork is perfect and the chandlier is so perfect in the space. I'm off to pick up my copy of BHG today- cannot wait to see! Your corner is very inspiring. I love, love baby tears! It's beautiful! I would love to have a corner like this to sit & drink my coffee in the mornings! LOVE that little ball of baby tears! Clever, girl...clever! Great image! I'm obsessed with toparies, and I just love love love those little topiaries and plant ball!!! Too bad I have a brown thumb!! Hey, at least the plants die in pure style! I tend to stick with super easy plants like pothos, spider plant and the zee, zee plant...it loves the shade and never wants to die! Misting and a little plant food in the spring is a great idea as well. I love plants! A designer once said (can't remember who) every room needs something living, whether it's a plant or animal! I'm still waiting for my Better Homes & Gardens to come in the mail. I too have a "black thumb of death" with plenty of flora bodies buried in the back yard. I love plants, purchase them on a whim and yet they die. It's a tad upsetting. Where did your floral/botanical print come from? I don't recognize it from previous posts.